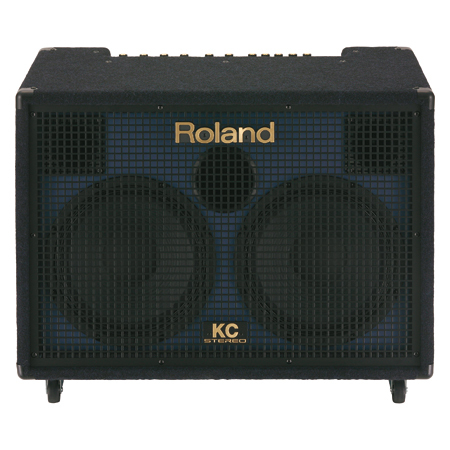 KC-880, Keyboard Amplifier from Roland in the KC series. The Roland K 880 is a 5 channel 320 Watt keyboard amplifier with two 12 inch subs and 2 tweeters. It does have DSP Effects on it and cost just under a grand. If needed, you can hook two of these units together in stereo and get a lot more power. This is one of the best keyboard amps that our band as ever had. 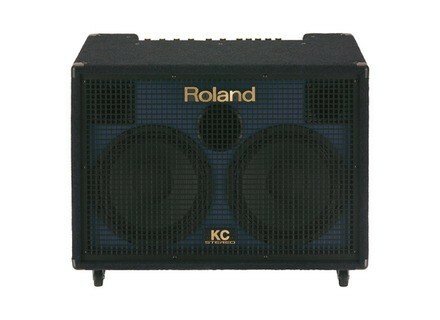 Our keyboardist loves this amplifier and he says that it is the best one that Roland has ever made. The DSP effects on it include rotary, chorus, reverb and a few others. It has a footswitch input that you will have to go out and buy a footswitch for, and then you can use it to control those effects. It has a 3 band EQ (low end, mids, and highs). The weight of this amp is almost 1 hundred pounds. That is very heavy, that is the only downfall of the Roland K 880. It is a huge hassle to have to lug this thing around from venue to venue and in and out of our van. That is the reason why we don’t hook two of them up together in stereo because that would just be 200 pounds of gear that we would have to carry. Just thinking about it gives me a backache. The size and dimensions of the Roland K 880 are not bad. But with it weighing that much makes it a huge turn off. Overall this is the best keyboard amp from Roland. We have used just about every single Roland amp that there is and the Roland K 880 is better than the rest and is still affordable. The issue is that it weighs just too much to take everywhere. We now find ourselves not taking this amp with us all the time because of the weight. Our sound might be suffering a little bit too. But we just cannot take this everywhere. stf74's review (This content has been automatically translated from French)" The ergonomic pachiderme"
The handling is easy and the manual is clear and limpid. a gain control for each and multiple AUX inputs, it is very convenient in terms of ergonomics and can connect multiple widgets on: I plug a bass, keyboards, electronic drums and the Ipod and groovebox above. This really is the best for the home studio plug and play electronic drums (that for which I use). The clean sound is very airy and silky low enough, it's really good stuff. Side effects, I do not use it yet. What motivated my purchase is above all I was playing with a friend who had a KC550 with its trendy + my bass keyboards and the sound was very good. I researched this model OCCAZ and I fell on the KC880 has a very good price. It's really an amp for fun and to connect various instruments in record time. This is a bit of a mixing desk with amplified speakers all in one and it weighs a dead donkey, help for lugging this thing together (plus the handles on the sides are very poorly designed and breaks wrists -1 for this). It's big, heavy, bulky and it sends (a bit like me but I sent a lot less). With the experience I remake that choice instead of buying full amp bass, keyboards, table, voice, etc ...; it saves space, money and the sound is more "uniform." Djoe_Drums's review (This content has been automatically translated from French)" excellent keyboard amp"